One of the best ways to bond with your foster child is to work with them on a craft that will help boost their sense of creativity and self-esteem. Parents know the joy of seeing their child proudly showing off a macaroni necklace or hanging their latest finger painting on the fridge. Of course, not all crafts are created equal – model rockets, erector sets, homemade volcanoes and the like can sometimes cost a fortune, and then you, the busy foster parent, have to figure out the complicated instructions! Forget all that – FAFS has spent time scouring the net to find some great foster care crafts for bonding. At embrella, we understand that parents balance their time and money every single day while finding time for bonding with and fostering the development of the children they care for. That’s why we’ve compiled this list of some of our favorite DIY craft ideas that use things you probably already have in your home. For those supplies you might not have on hand, we’ve included prices* from retailers with direct links so you can prepare for the next rainy day or creative outburst and help your child create something they’ll be proud of. To top it all off, at the end of this article we’ll explain how FAFS can help you afford these supplies with our Fostering Wishes For Children program. *Prices may change and supply may be limited, and some linked items may not be the exact items featured in the linked tutorials. These prices are provided as a guideline for the overall cost of each activity – always consult the instructions first, and then your local retailer for up-to-date pricing information. Kids break crayons. It just happens – and although usually they can just keep on coloring, we thought this was a great way to turn those broken bits into an affordable and fun project that will help your child to keep creating art even when their crayons are too busted to hold. Perhaps the best part is that your child is basically making their own crayons from scratch – they can either put all the same colors together or mix them up and create rainbow crayons! These wind chimes are a great project because they provide both visual and audible feedback – your foster child can hear their artwork every time the wind blows! On top of that, they’ll be helping to decorate your front porch or yard, which will help them to know that your home is their home, too. Because this project depends a lot on sizing things, we recommend that you buy these items from retailers in their stores instead of purchasing them online. Tie-dye shirts are classic. For those who have seen but never made them, HGTV has a great, simple tutorial using foods you probably already have at home that will help you make red, blue and yellow shirts. One of the best parts about this is that you can easily make shirts for every kid that takes part! After soaking them for 24 hours, you’ll be ready to show off your family tie-dye tees to all your kids’ friends! The sound of falling rain can be pretty soothing, so why not let your foster kids recreate that sound whenever they want? This project is great because the kids can be surprised that the sound of rain is so simple to replicate – and as long as you don’t mind a little bit of “rainstick swordfighting” (as the author described it), this project will be perfect to help your child expand their creativity as you bond with them. As a parent, you’ve probably figured out why all those campground gift shops and novelty stores often put collections of geodes – those broken rocks filled with crystals – right in the center of their shops at the perfect level for children to see: Kids LOVE these things! They’re colorful and shiny, and on top of that, it’s neat to see beautiful crystals on the inside of what looks like a regular rock. 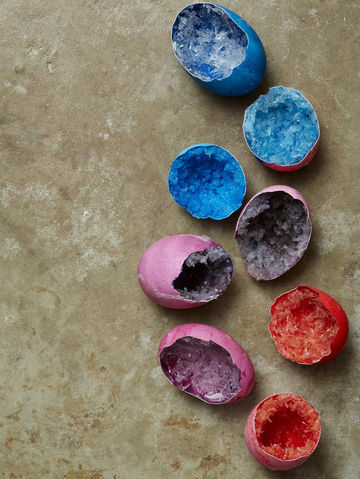 Parents.com has provided this great tutorial to help you bring some of that geode magic to your home without breaking the bank on souvenirs. Best of all? Kids with an interest in science can marvel at the way salt forms such striking crystals! With just a few simple tools and ingredients, you can start bonding with your foster children today. These DIY foster care crafts for bonding are sure to bring smiles to their faces and give them final products they can hold in their hands and be proud of. Although we’ve tried to find reasonably priced crafts and projects that use tools or ingredients you probably already have, we know that every last penny counts. That’s why FAFS has a special program available to licensed New Jersey foster parents who currently have a foster child (who is not adopted) in their home – it’s called Fostering Wishes for Children (also known as Fostering Wishes). The Fostering Wishes program can provide you with up to $100 per foster child in New Jersey to help them explore their creativity, attend special functions like prom, pay for yearbooks or bond with you during a special activity at home. You can even use this money for the crafts listed above! To apply for your $100 grant, simply visit this link and fill out the form. When you’ve completed your crafts, please feel free to share the results with us on social media – you can find us on Facebook(link), Instagram(link) or Twitter(link)! NOTE: Never publicly share photos where your foster child’s face is visible. Such photos are in violation of CP&P policy and could affect your placement. Frank Alvarez is the Digital Media Coordinator at Foster and Adoptive Family Services.